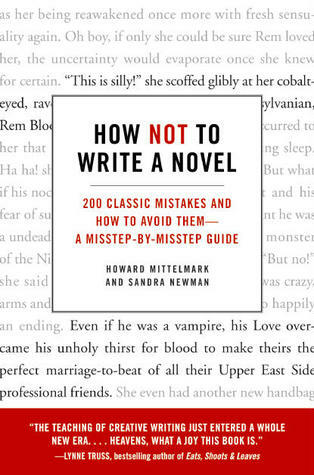 This book, a book about writing, had me laughing aloud on the commuter train. Yup, I was that person going to crazy-town, the kind of person you aren’t sure you want to sit next to (though, I’m starting to realize that can be a good thing for others to think… it can mean a seat all to myself!) Back on subject now – this is a gem of comedy. At one point there is a quiz to help you identify just how stereotypical your characters are and there’s a part about “grandma” and, well, I don’t want to spoil it. Just trust it’s good. Comedy in of itself is a good reason for this book to be part of your life. Add that to the fact that it gives some lovely advice and you have a truly excellent piece of work. This is a quick read. It’s laid out in a number of quirky little essays that give you a blunder (which, occasionally, made me cringe as I remembered these mistakes being my own) and then tell you just why this is a problem and why you should do to avoid it. Usually the advice was just not to do it. If the solution wasn’t that simple then it gave a couple more examples, all remaining tongue in cheek. It’s a brilliant and easy to read book that is a good reminder of some novel best practices. Still, this didn’t quite earn top marks just because I hold writing books to a high standard. I want the book to be hard to get through because I’m constantly setting it down to fix something or compose something new. While this book did get me to jot down a couple notes to improve my current work, it didn’t draw me away enough. In fact, to a certain extend, the book was a distraction because it was so darn funny. What a paradox! It’s a strange thing to downgrade a book for, but there it is. I think all kinds of people, even the casual writer, will benefit from the easy suggestions of the book. More importantly, everyone can value a good chuckle on the train, even my slightly weirded out seat-mate.